The thousands of temples that are spread across the plains of Bagan (sometimes spelt Pagan) are the most impressive testament to the religious devotion of Myanmar’s people – and rulers – over the centuries. They combine to form one of the richest archaeological sites in Asia and provide views quite unlike anywhere else on earth. For practical information on restaurants, ATMs, accommodation and trasport, visit our towns of Bagan page. One of the beauties of spending time in what is now officially called the Bagan Archaeological Zone (which also comprises four main settlements) is that, once you have paid your K25,000 entry fee, you have the freedom to explore this vast and fascinating area at your own leisure – the entry ticket is valid for three days. Bagan is in general more touristy and possibly less of the ‘real Myanmar’ than other parts of the country, but despite obvious sales ploys such as the multitudes of children selling hand-drawn postcards, you will rarely suffer the hard sell – and the locals remain warm and friendly. 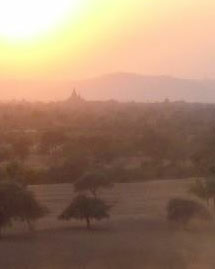 Bagan was the capital of the Kingdom of Pagan from the 9th to the 13th centuries. 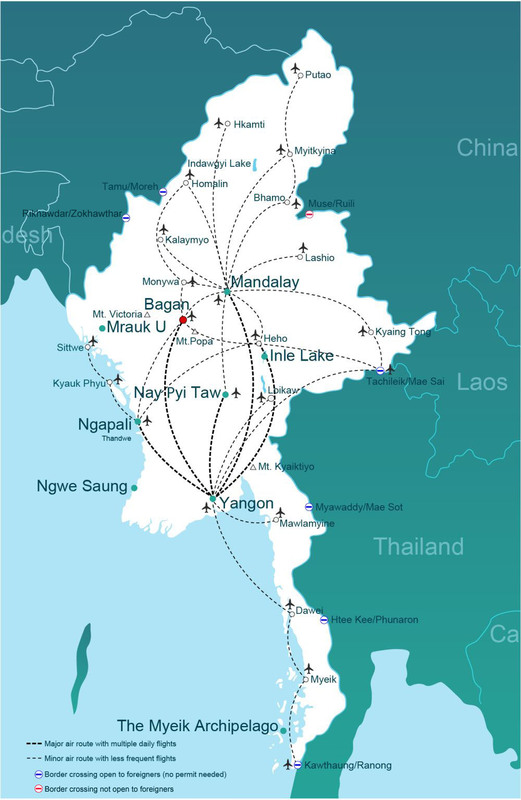 This kingdom was the first to unify the area that is now Myanmar, establishing the Burmese culture and ethnicity, as well as Theravada Buddhism, in the region. Over this period of rule, as the city and kingdom grew in influence and stature, over 10,000 temples were built on the plains surrounding the capital next to the Irrawaddy River. After Mongol invasions eventually led to the fall of the Kingdom of Pagan, the city was reduced to a small settlement, never to recover its former glories. The area did, however, remain a destination for Buddhist pilgrimage. A few hundred temples were added between the 13th and 20th centuries, but the extensive earthquake damage over the years means that only 3,800 monuments of various size remain, in varying states of repair. Indeed, over the last 500 years many of the existing temples have been renovated – a process that, continuing to this day, has yielded mixed results. It is said to be due to the government’s insensitive ‘updates’ in the 1990s (including a golf course and modern watch tower) that Bagan has not attained UNESCO World Heritage site status, although it is once again being considered. But the area is large enough, and there remains so much of what is original still to see, that none of this stops the temples of Bagan being a unique wonder to behold. Every one of the 2,200 plus temples, stupas and pagodas has its own unique story to tell, and the interiors of many can be freely explored. Note that as of November 2017, the climbing of temples as been prohibited; you can find a list of purpose-built viewing platforms further down this page under 'Individual temples and viewing'. The most spectacular time to see the temples is when the sun dramatically rises and falls over the plain at dawn or dusk. The large earthquake that hit Bagan in 2016 caused significant damage to some of the temples, but ironically much of it was to more modern additions to ancient structures. The view of many is that the quake may actually encourage more sensitive development in Bagan, and the majority of temples are free to be explored. Hire a bicycle. This is the cheapest way to get around, and also allows you the most freedom to do as you choose; the plain is too large to explore by foot, but getting around by bike allows you to get to most of the temples. Almost all hotels and guesthouses have them for hire, as do various restaurants and shops on the popular ‘Restaurant Row’ in Nyaung U. Prices are usually around K2000 per day. You can hire an electric bike for around K8000 per day – though on the flat plains of Bagan, the advantages over a bicycle are minimal. Tourists are not allowed to use motorbikes in Bagan. You can pick up a free tourist map showing you the main points of interest; although you are unlikely to get seriously lost, it is worth planning your trip in advance to make the most of your time. Bear in mind that it can get hot and dusty when cycling, particularly in the hot season, so you should take water with you. There are plenty of restaurants around the place to pick up refreshments. Go on a horse and cart guided tour. This is many people’s favourite, and certainly the most romantic way to see the temples. Most drivers speak at least some English (it is worth checking before you agree the price), and will of course know good routes around the temples and some hidden gems. However, horses have to follow more well-trodden tracks than bicycles, so there are areas they cannot reach. Prices range from K15,000 to K25,000 for a day, depending on the season and where you hire the horse and cart from (New Bagan tends to be more expensive). Carts can be shared between two or, at most, three people. Take an air conditioned taxi, if you want to avoid the heat and dust completely. This is naturally the most comfortable way to get around, and most drivers speak English. Cars will usually cost between $20 and $50 per day, depending on the season and how far you travel. The most exotic and spectacular way to see the temples is to head to the sky for a hot air balloon trip. These cost US$305 per person, and offer a unique view of the plain and temples. Balloon tours can be booked here; you should always book well in advance, particularly at popular times of year such as Christmas and New year (the Bagan ballooning season runs from October to April). Taking two or more days and using different forms of transport can be the best way to explore the plain. If you see the highlights by horse and cart or hot air balloon, then following it up with a bike ride can be the ideal way to find the specific temples that have taken your fancy. Beyond the transport options listed above, you can also get around by trishaw and small pick-ups. These are cheap (usually no more than K500), but trishaws can only be used for short distances in towns, and pick-ups only operate along the main road from Nyaung U to Old Bagan and on to New Bagan. 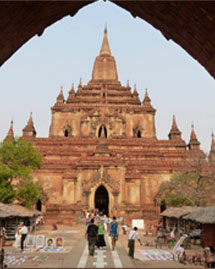 To find out more about Bagan day tours and other activities, click here. To get in touch with one of our experienced travel advisors, fill out this form. The huge and beautifully preserved Ananda Pagoda. In late December to early January, there is a huge festival centred on this temple celebrates the traditional lives of farmers in the area; locals come from the surrounding villages in their decorated bullock carts and camp on the plain for the duration. Entertainment is provided by theatrical troupes and on the final daybreak there is a formal alms giving to the monks who live in the nearby monastery. The Gawdaw Palin temple, which sits on the banks of the Irrawaddy. The teak-built Myoe Daung Monastery and Tharabar Gate in Old Bagan. The imposing, red brick Dhammayangyi temple, which covers the largest area of all the temples in Bagan. The That Byin Nyu temple, the tallest monument on the plain. The Shwesandaw Pagoda, with its five stepped terraces. Viewing hills and platforms are located at Ko Mauk Lake, Oh Htein Kone, Nyaung Lat Phat Kan and Sulamani Kone. Of all the pagodas in Bagan, the Shwezigon pagoda in Nyaung U is most like a traditional Myanmar temple complex. This, as well as the other pagodas in and around Nyaung U, typically attract the biggest tourist crowds. But away from the towns, exploring off the beaten track can provide the most fun of all; the pagodas that can be found further east along the banks of the Irrawaddy from Nyaung U are just one example. Here you will find open temples with beautifully preserved interiors and fantastic views over the river – and very few other tourists. For a full list of temples, as well as detailed descriptions, go to Bagan.travelmyanmar.net and for Bagan festival dates and locations, go to our festivals calendar. For a wider selection of photos from Bagan, go to our Flickr photo album and for a great drone view of the temples, check out this YouTube video. To get a bit more background and history when you are in Bagan, as well as see an impressive collection of artefacts from the region, you can pay a visit to the Bagan Archaeological Museum (located just off the main road near the river bank in Old Bagan; entry $5). 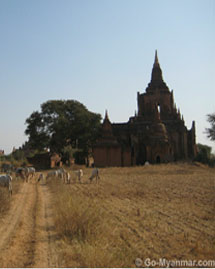 For accommodation options, go to the towns of Bagan. 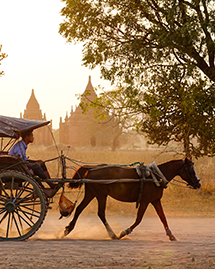 Select your preferred form of transport to see the routes available to get to the temples of Bagan. The Bagan Archaeological Zone, as the larger area is formally known, comprises the temples of Bagan and four main settlements – Nyaung U, Old Bagan, Myinkaba and New Bagan; you can find information about them below. Visitors are required to buy a K25,000 entry pass for the zone.